This device traps houseflies instead of killing them. So you can release them back outside. It’s called Electronic Housefly Trap. It uses natural fly food as bait such as overripe fruit. 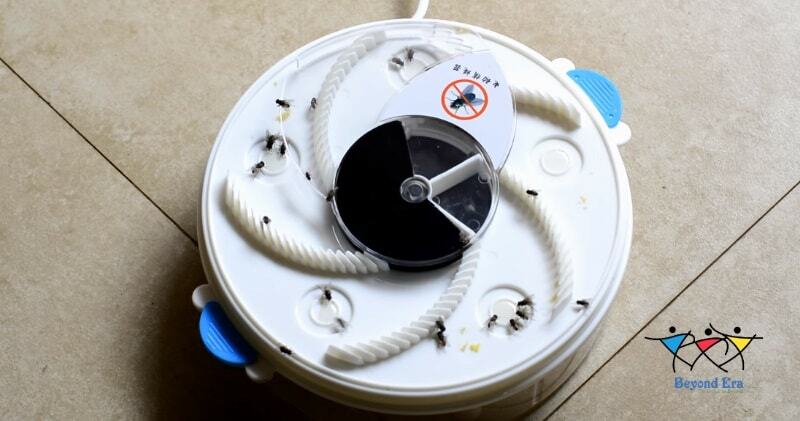 The circular fly trap has a series of bowls around the perimeter of the trap where you can place something that will attract the flies. And the trap will rotate it’s arm, scooping up all of the flies in the bait traps. It’s made from non-toxic material, is super effective at clearing away flies. It’s non-toxic and does not have chemicals, making it safe to use around food and children.This is a more humane solution than other fly traps or sprays. It’s safe and effective for use on all flies, even ones that are pesticide-resistant.